A week before formal classes begin, but a week of festivities and outdoor carnivals in the greens. There are booths everywhere, with clubs trying to sign up hopeful students, local merchants displaying their wares, show-offy students playing the lute or juggling or doing pantomime. A mermaid sits on a wooden seat above a case of water, waiting for someone to toss a baseball onto a target, causing her to drop into it. "Come on, anybody? I'm drying out here!" Everywhere you go, there's a mixture of humans, elves, dwarves and miscellaneous others. Wherever you come from (unless you're from Sigil --or maybe the Rock of Bral), you've never seen such a diverse group of people in one place (without massive bloodshed): a shaggy-haired human male and a tiny cackling pixie whispering conspiratorially in a corner, a dragonborn in a button-up shirt decorated with loud colors and pineapples and a half-orc in a gold-and-white athletic jacket helping a buzzcut-wearing human male do a keg stand, a young human of indeterminate gender sitting on a wall with a rod that allows them to whirr a little wheeled vehicle up and down the walkway, almost tripping a warlock girl dribbling a red rubber ball while she talks to short human girl with a backpack that holds two softball bats, one on each side. Elsewhere, a middle-aged orc in a soiled apron swats a fly with a spatula, wipes it on his pants, and then holds up a slice of pizza on a plate. "Hot an' fresh, ya ingrates! Odo's pizza, one copper a slice!" A group of girls in matching white and gold outfits including tiny skirts and saddle shoes, led by a drow, hand out flyers to various other ladies they pass. "Cheerleading tryouts on Beginnings 5. Come out and be judged... not you." Near the center of campus, a trio of tents are set up for late registration, with lines leading into each. One says "General students, A to L", the next "General Students, M to Z," and the third "All Names with Apostrophes." A rather ordinary, if arguably cute girl with dark hair sat down the wall from the person controlling the tiny vehicle. He legs were crossed in what might be a lotus fold, if she knew what that was. She seemed comfortable in the position as she watched people and other beings pass by. To the observant, her attention seemed focused on the females in the crowd. Most notably the human or near-human girls. She'd watch one for a while, and then turn her face down to her lap before again looking up to spy another girl, which she observed for a while before again changing focus. Sometimes, if the girl she was watching made gestures or mannerisms or moved in certain ways, the darkly-dressed girl would mimic the moves in a subdued fashion before turning her attention to whatever was in her lap. She made no effort to draw attention, though her seat wasn't too far from the action of the nearest busy pathway. She tried not to stare too obviously when the sports duo walked by, but her aping of the shorter girl's grip on her backpack was a bit more obvious than most of her mimicry. As Silgon is walking around taking in the sights and familiarizing himself with the campus, he will stop by the area with the Mermaid, pick up a ball, and give her a look.... of should I? And since she did say she was drying out... give it a good hard toss at the target. The person sitting beside Marty looks up at her every once in a while, even though their attention was mostly on the car they were zooming around. "So, you a doppelganger or something? I mean, none of my business, if you don't want to talk about it." The tiefling they almost tripped glares at them, but her softball-wielding friend talks to her and they walk away. The dragonborn tosses the ball hard and slightly off center, but it was solid enough to trip the target, and the mermaid is dumped into the water. There's a smattering of applause, and the woman operating the booth --a brunette woman in simple, handmade clothes-- hands him a coupon which reads "One free slice, Odo's pizza. Redeemable at the manager's approval" The mermaid leans on the edge of the cube. "Isn't it Andrea's turn?" "But the water's so coooooooold," an auburn-haired girl nearby says. As makiharra walks the campus seeing sites and races most unfamilair,she begins to breathe in the knoweledge and she grins so happily. Seeing a halfdrake half man knock a odd merfolk in the water with a sphere,intresting nonetheless,she considers going to try out for this "cheerleading they must be acrobatic,she muses quietly i hope i dont have to perform no talent at that yet." A brightly feathered young woman in sailor's clothes walks through the campus taking in all sights around her. Her brightly colored feathers folded tight against her arms, she nods and says "hi" to anyone who even remotely makes eye contact with her. She holds a treasure chest in her hands as she walks up to a table marked "M-Z". "Hello," she says cheerfully. "I need to register. My name is Rae Quetzali." Marty looked at the guy speaking to her, and frowned in confusion. "Uh... what's a doppelganger?" She finally asked, and then after a continued pause with more brow creasing. "And why would you think I am one?" Everything here was so new! And overwhelming. And confusing. "I'm sorry. I can leave if I'm bothering you." But the cheerleaders where walking by, giving her lots more girl mannerisms to observe, which she did. She knew they were cheerleaders because she saw a poster talking about cheerleader tryouts. But she wasn't sure what cheerleaders did, other than, she guessed, lead cheers. But where did they lead them? And why would cheers need to go anywhere? "Thanks." She took a flier handed over by one of the girls and glanced down at it. It was pretty much a smaller duplicate of the poster she'd seen. A girl that seems mostly human looking but with squirrel ears and tail looks around the entire campus with slack jawed awe as she walks towards the line for the A to L tent and talks out loud to seemingly herself. "Oh Wow so this is Sigil!? There are so many people here people here! And so many different kinds! Like that cool fishlady and cool dragonman." As she enters the line she waves excitedly in the direction of the aforementioned mermaid and dragonborn (though she didn't know that's what they are called) not even caring that they might not even notice her. She then also looks at one of the other registration tents. "I didn't even know you could spell names with apostrophes!" Walking around would be a rather thin fully cloaked and masked man walking around as he was enjoying the scenery. He was looking around and found some folks playing flutes and what not and decided to try something. He got to a spot where people were walking around as he pulled out a violin, he noticed the woman mimicking people she saw but didn't make any notice that he saw her but he was close enough. With a few first notes being played on the instrument that were soft and calm he would then tab his foot and bob his head getting ready. Soon he went to work playing a song on the violin and even got into a dancing jig while he played and got into the music himself, also hoping to do some entertaining as well. A portal blooms into being at the edge of the campus, aetheric gears blooming around it's edges. 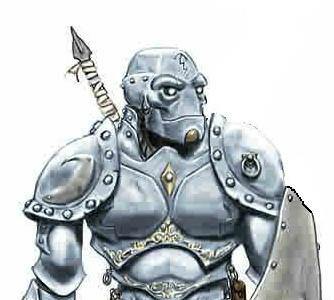 Through it step four metallic figures, Warforged of Eberron. One is painted all black, with red lights glowing from under his plating. He carries nothing but a dagger at his waist, and hunger in his eyes. The next is thin, what would be called emaciated in an organic, and stood much shorter than the others, carrying a slender rapier. The third is almost exaggeratedly female, wearing a tank top and shorts over her turquoise casing, molded in some almost inhuman ideal of beauty, and looking all the more artificial for it. A whip is at her waist, and a massive axe and hammer on her back. At the forefront is one covered in scale armor under a black cloak. He holds no visible weapon, but he is by far the largest of the four. A veil of chainmail hides his face, and as he looks over the crown a shudder plays over him. If one could hear his thoughts, it would ruin the image he presents. Oh gods, oh GODS, they're everywhere. They're touching...oh...OH...AAAGH! Why am I here, this is sadistic! He expects me to just...go among them? This is sick! The other three move on to the realm of NPCs, leaving 001 to make his way through the crowd to the registration tents. More than once he is thankful for his limited expressiveness, if the fleshbags could see his feeling on his face it would be mortifying.